Discussion in 'Honda' started by workbench, Jan 13, 2019. Came across this product on Amazon. Does anyone have experience using this product? I don't have experience, but I've read about it. It's for Tesla Destination Chargers, which provide L2 charging, not fast-charging. They can be found at hotels and some other businesses. The adapter is not usable with Tesla Superchargers, so don't be fooled into thinking this will let you tap into the Tesla network for high-speed charging on a road trip! 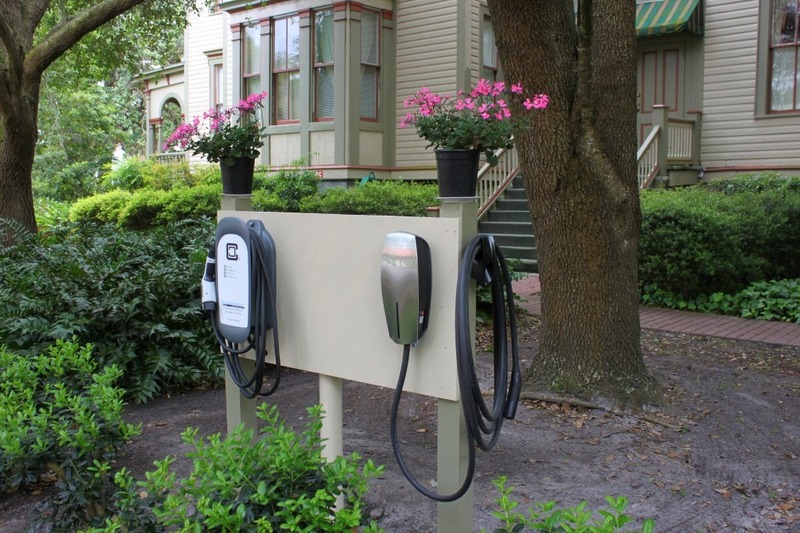 Here's a photo of a typical installation; Tesla often installs a Clipper Creek charger, with a J-1772 plug, alongside their own L2 charger, which has a Tesla plug. I've been using one for a couple of months now, and it works fine. In my case, I use the standard 32A version for my Clarity PHEV; the Clarity limits the charging current, so there was no advantage to a 40 or 50A version for me. If you have a PHEV Clarity, you might note this. Not sure if Honda has the same charging circuit limitation on the BEV version. I have the 50amp version just for peace of mind. Well made and works well for the 100amp circuited Tesla charger we already put in our garage. There has been a lot of discussion and argument over this point. But Tesla doesn't own these chargers; they only install them. The property owner owns them once installed, and is responsible for supplying them with power and maintaining them. Tesla doesn't pay for the electricity charging your car, as they do at Superchargers. It's up to the property owner to set rules, or not, for who can or can't use them. If Tesla intended their destination chargers to be used only by Tesla cars, they could easily put software limits in them to charge only Tesla cars, which is the case at their Superchargers. And also, if Tesla intended only for Tesla cars to charge at their Destination chargers, they wouldn't be installing Clipper Creek chargers alongside their L2 Tesla chargers. If some Tesla car owner is tempted to "key" someone's non-Tesla car when it is -- quite properly -- using a destination charger as Tesla intended, well then... you can find a-holes among every part of the population, even including Tesla owners. EV charging etiquette is something for which our society is going to have to come to a consensus. That will take time to develop. In the meantime, I suggest leaving a note on someone's car if you think they are abusing charging stall privileges. Preferably a polite one, since we don't yet have a consensus on charging etiquette. In fact, some people have such notes printed up in quantity in advance, for this specific purpose. Texas22Step, workbench, ClarityDoc and 1 other person like this. Also can't Tesla's use J1772s if they need to? So can I key a Tesla using a non-Tesla charger then? Also can't Tesla's use J1772s if they need to? Only if the driver has a J1772 adapter for his Tesla car. But at least Tesla does sell those for the MS/MX... not sure about the Model 3. So can I key a Tesla using a non-Tesla charger then? I guess that depends on how sharp the edges are on that non-Tesla charger. Why would you need a different charger cable than the one that came with the car? The Clarity has a built in generator. It's the most convenient way to charge. If you need more than 40 miles of ev range on a daily basis, then you bought the wrong car. The money you spend on other adapters would not save you that much money unless you drive more than a 100 miles a day. It would be more inconvenient for me to carry around a charging cord in my trunk all the time. It's just so much easier to go to the gas station. I can't wait for the environmentalist to chime in. 1. Using the Clarity's ability to use the gas motor charge the battery is the least efficient, most wasteful and most expensive way to drive the car. Yet here you are actually advocating that. 2. Saying "I can't wait for the environmentalist to chime in" is obviously an attempt to provoke a fight, which is what trolls do. If you are not trying to be a troll, then you need to learn some lessons in civility and how to behave in a social setting, before you are allowed to post online again. Did anyone really ever try to use the adapter from Level 3 to SAE/J1772 (Level 2)? My neighbor has a Tesla adapter from Chademo to J1772. I just don't have the guts to try it on my Clarity..
Chademo is a fast DC standard not AC. The PHEV Clarity can only take AC and cannot benefit from higher than a 32 Amp Level 2 EVSE but it is safe to use a higher amp Level 2 EVSE. Trying to put DC into the AC to DC onboard inverter/charger of the PHEV Clarity will result in electrical Armageddon and summon the Four Horsemen of the Apocalypse! Not to mention destroying a perfectly good PHEV and maybe your garage and house. Feel free to correct me if I’m wrong on this. Well, I'm not sure you'd actually get the Four Horsemen of the Apocalypse show up. Maybe only two or three. Yes, this is an opinion often expressed on Tesla fora. Many times I have had to wait for Teslas to finishing charging as they use their adapters on CHAdeMO stations. Destination chargers installed by Tesla are unlike Superchargers in that their power is paid for by the destination business. If I patronize their business, I have no problem using their Tesla charger for our Clarity/Leaf. It is unfair for Teslas to freely use J-1772 and CHAdeMO stations and then ban others from "their" precious stations. Contrary to Musk's stated objectives.